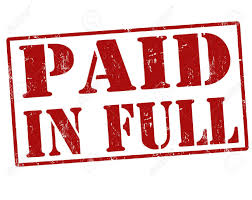 I had a debt that scared me to death… Jesus paid it! I’m grateful!! Have you ever gotten a bill that scared you nearly to death? I have! When you received it you realized you owed it – your name was on the contract, your credit card was involved, your name was on the sales slip. In fact, it may have been incurred by your own foolish decisions or neglect. You were frightened, you were overwhelmed, and you did not know what you were going to do in order to pay it! My sin left me feeling that way! Guilt overwhelmed me! I knew God would hold me accountable! I felt guilty. I realized I had wronged both the Lord and others and I had no idea what I could do to make it right. The debt was too great!